The long-running television series Bewitched is probably the best-known use of witches in romantic comedy, but a film about a beautiful witch attracted to an uptight dope actually beat Bewitched to production by over two decades (and may have inspired its more popular TV counterpart). I Married A Witch stars Veronica Lake as Jennifer, a witch with an origin story more appropriate for a horror film: She and her father (Cecil Kellaway) were both burned to ash during the Salem witch trials. In revenge, the still-sentient pair places a spell on the family of the man who exposed them. 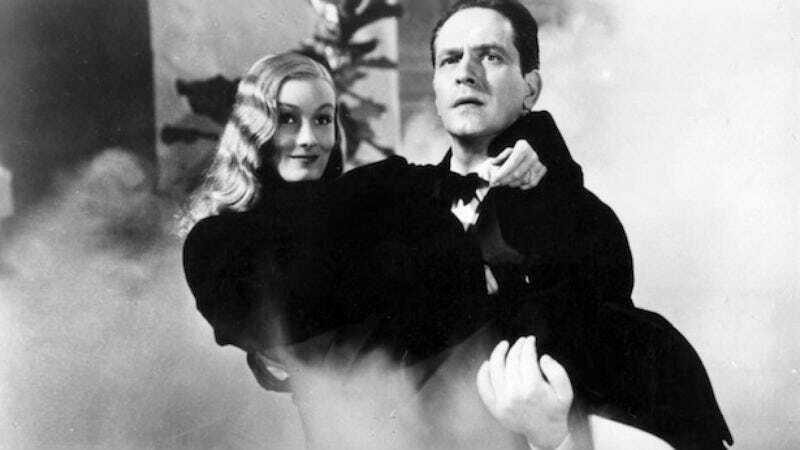 Hundreds of years later, Jennifer and her father return to corporeal form to further torment descendant Wallace Wooley (Frederic March). Specifically, she aims to help along her curse that dooms every Wooley male to marry the wrong woman. Wallace, a candidate for governor, is already well on his way, engaged to Estelle (Susan Hayward), but Jennifer endeavors to seduce and abandon him anyway. She only further complicates matters by actually developing feelings for her prey, much to the chagrin of her vengeful father. Various transmogrifications, revelations, and general shenanigans ensue. I Married A Witch is fairly heavy on incident for a 77-minute movie; it has the bones of a screwball comedy, but with a more whimsical soul. The unforced sense of whimsy helps along a romantic comedy that’s more charming than uproariously funny. Lake wasn’t necessarily a comedian by trade, but she’s winning here as she makes mischief, then surprises herself with real human emotion. Her iconic look also contributes to I Married A Witch’s visual lushness. Though the film’s witches aren’t horror-movie villains, director René Clair nonetheless uses the witchcraft conceit to conjure some gorgeous black-and-white images, most memorably the process by which Jennifer morphs from a plume of smoke with voiceover to full Veronica Lake knockout status. The spell her father uses to summon her new human body requires a large amount of fire, so Lake emerges naked from inside a burning building—her modesty protected by an unsuspecting Wallace, of course. The movie is a trifle, but a good one; even small doses of magic can be intoxicating. Availability: I Married A Witch is available on Criterion Blu-ray and DVD from Netflix or your local video store/library. It’s also streaming on Hulu Plus.